Packing an outer layer in a carry on bag can be surprisingly difficult. Do you bring a lightweight jacket, a fleece, a hoodie, a shirt/jacket hybrid? How do you balance the bulk of a warm outer layer with packability and functional day to day use? The answer might be to actually… not to try. A travel jacket or hoodie just isn’t always the best outer layer for every trip. No, really. Urban destinations, muggy climates, lots of travel days, and limited packing space can turn your expensive, state-of-the-art travel jacket into a bulky liability trapped in the bottom of your bag. And the solution to your outer layer packing woes might just be a travel vest. That’s right, I said “travel vest.” We’re going to take a look at all the reasons you should pack a travel vest for your next adventure, and why the right travel vest may actually be better than that bulky (and expensive) jacket or fleece you’ve got your eye on. 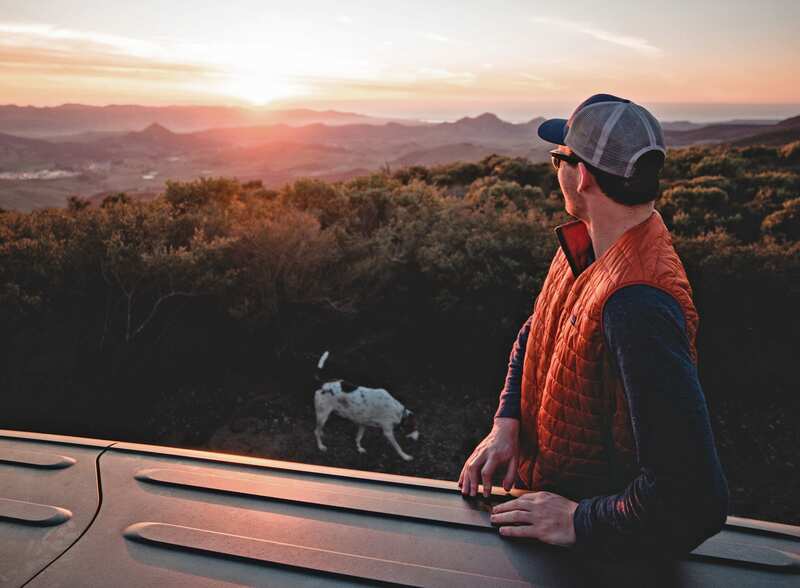 Here’s a guide to the best travel vests for any trip. Ok, I get it. You’ve never worn a travel vest before, or they’re just not your style. Heck, maybe you just don’t know how useful the right vest can be. But I’m here to say that travel vests kind of rock, and much like the fanny pack, they’re more useful than they look. Here are some of the surprising uses for a travel vest, and why you should wear a vest on your next adventure. A travel vest is basically an undercover extra carry on bag. Seriously, when you add up all the extra storage space and secret zippered compartments in a travel vest, you’re looking at a few extra liters of packing space. If you’re not down with the metric system, that’s a lot. If you’re flying on restrictive budget airlines like EasyJet, Spirit, or RyanAir, a travel vest may be a great way to pack in a slightly smaller carry on bag, which will save you a ton of checked (and carry on) baggage fees. Now, you don’t have to go overboard like the travel vest in this amazing Telegraph video, but you can get a lot of mileage out of one. And while the extra space is nice, I think the best part of a travel vest isn’t just the extra sneaky storage—it’s the on-the-go organization. Before I started using packing cubes I thought they were a stupid waste of money and packing space. The right travel vest is like a packing cube for your body… but cooler sounding. Load your travel vest up with your essentials—including your passport and boarding pass—before you even leave for the airport, and rest assured that you’ll have everything readily available on your next long haul flight. You won’t even have to struggle with the guilt of waking up that guy in the aisle seat to get to your battery charger. So that’s great. This should be obvious, but it’s worth mentioning—travel vests are a great versatile layer for keeping you comfortable on a long flight. You still have all the warmth of a jacket without the constriction of (usually) awkward sounding mesh fabric sleeves. 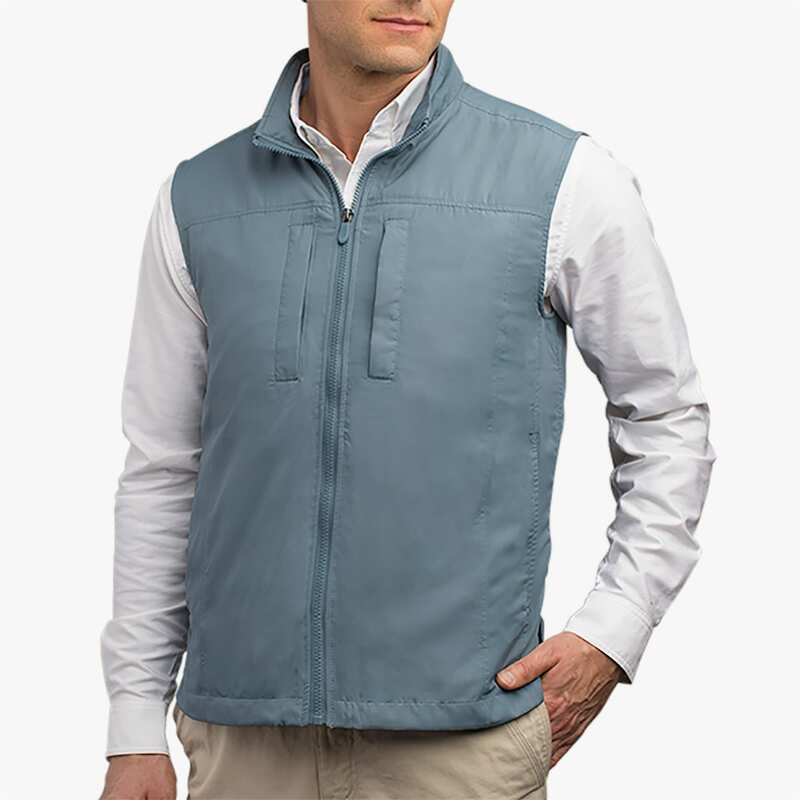 If you combine your travel vest with a nice merino long sleeve shirt or comfy long sleeve henley shirt you’re able to modulate and adjust your body temperature without taking off a layer (or your neck pillow, eye mask, and bluetooth headphones). The key to packing light and still staying warm in almost any climate isn’t one super layer “to rule them all.” It’s a modular capsule wardrobe of functional quality items that you can layer (and unlayer) at will to adjust to your surroundings. A travel vest makes a great outer layer, especially in an air-conditioned bus or plane. One of the coolest features of a great travel vest are secure hidden pockets. They might be one of my favorite ways to keep my stuff organized, but also super secure. And honestly, you don’t even need the hidden pockets to keep your stuff close and safe. A zippered chest pocket is a great place to keep your cash or passport because who on Earth is going to try to pick pocket your chest pocket? They’d have to stare you right in the eye while doing it! The whole point of theft proof clothing is that it makes it juuuuuust a little bit harder to steal from you than the average tourist. And a travel vest is perfect for that. The array of pockets lets you keep everything in its place (that you can check with a quick pat), but it also keeps your valuables out of the most likely places a pickpocket will look—namely your back pocket and any zipper they can reach on your backpack. Keep your stuff safe by keeping it actually on you, even when you’re asleep on that crosstown bus. Ever wonder why professional photographers usually look they just got back from an African safari? I mean, I guess some of them probably did, but you know what I’m saying. It’s because photographers have embraced the incredible power of the travel vest. A vest is the best way to keep tons of (delicate) stuff close to hand and organized without adding a lot of bulk to your back. With a vest, you don’t need to take your bag on and off to access anything, which is a huge plus for travel and action photographers. If you want to change lenses, you can do it in seconds. Need to change batteries? No problem. Want to eat a power bar while your time lapse runs? Reach into Mr. Chest Pocket there. Vests are great for hands free usage, including photographers and videographers that like to switch things up and shoot on the go. Hopefully you’re convinced of the merits of the travel vest. Here are some of the best travel vests for men and women looking to take their travel wardrobe up a notch. I was lucky enough to be one of the first people to test out this travel vest, and I’ve got to say, I’m a huge fan. The first thing that hits you about this travel vest is the quality of the fabric. I wasn’t sure what to expect, but plush comfy fabric wasn’t at the top of the list. However, the Bluffworks vest is one of the more comfortable pieces of clothing I own. And not just travel clothing. It looks great, feels even better, and travels like a boss. I usually wear it while biking around NYC (especially in the fall and winter, and hopefully this spring), this vest is a 3-season workhorse. In fact, this travel vest has turned into an almost proxy day bag for jaunts around the town. I keep bigger stuff in the interior pocket (it’s big enough for a notebook), and the zippered chest pocket is great for earbuds or chapstick, to keep me organized. I like having the option of both a snap and zipper closures for both bundling up on windy/rainy days (zipper) or letting a little breeze in when I’m on the go (snaps). 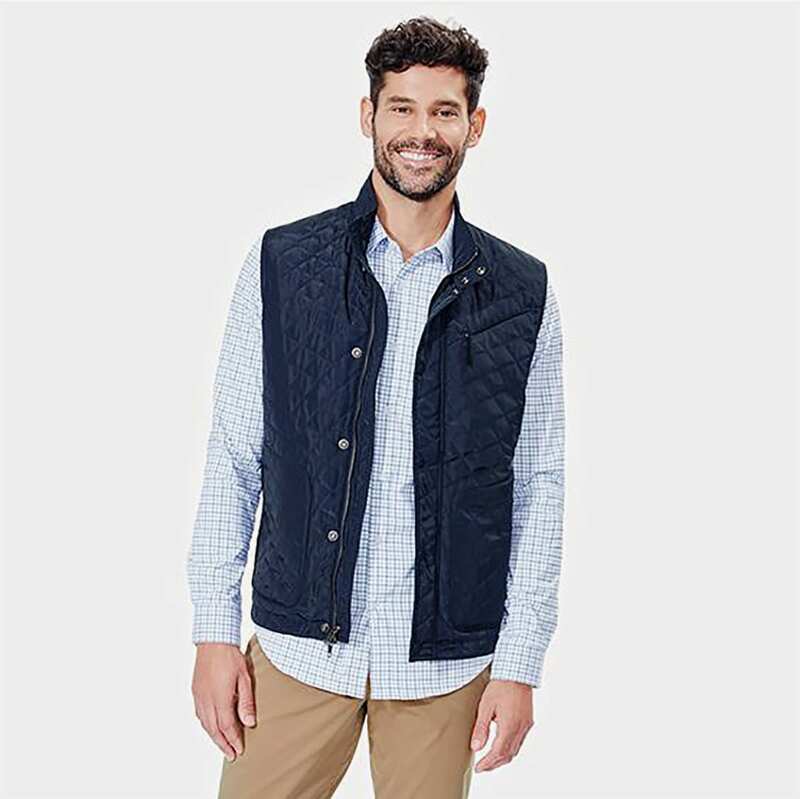 I’m a huge fan, and usually add this vest as a top layer to any long sleeve shirt or shacket for a classy look, loads of pockets, and a lot of extra comfort, especially when I’m headed to the airport. If you want a budget travel vest that’s simply brimming with secret pockets and hidden storage, the Rothco Travel Vest is for you. It features 24 pockets(!) including some nice little touches like pen pockets, interior zippered pockets, and even a large “hidden” interior lumbar secret pocket to keep your passport or cash super duper safe. This vest looks simple and non-descript on the outside but it’s loaded with secret places to stash your cash. If you’re looking for something a tad lighter and more packable, the SCOTTeVEST Featherweight Vest might be a good call. 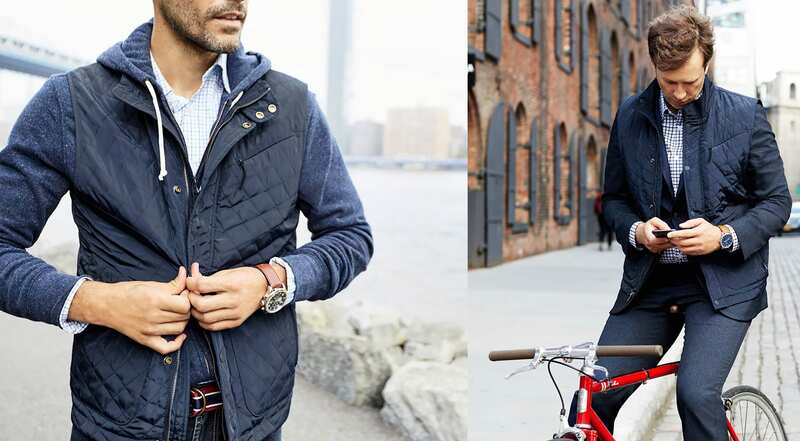 If you’re unfamiliar, SCOTTeVEST makes travel jackets, hoodies, and of course vests that are crammed with secret pockets. It’s kind of their thing. And this vest is no exception. Stuffed with 16 pockets this is still a lightweight outer shell that’s great for tech obsessed explorers. And honestly, that’s probably the best use case for this vest. It’s not quite as stylish or plush as the Bluffworks Quilted travel vest, but it’s loaded with pockets to help you stay organized. If you need a pocket for your ereader, phone, headphones, passport, a snack, ipad, and I dunno… a glazed donut, this is the travel vest for you. 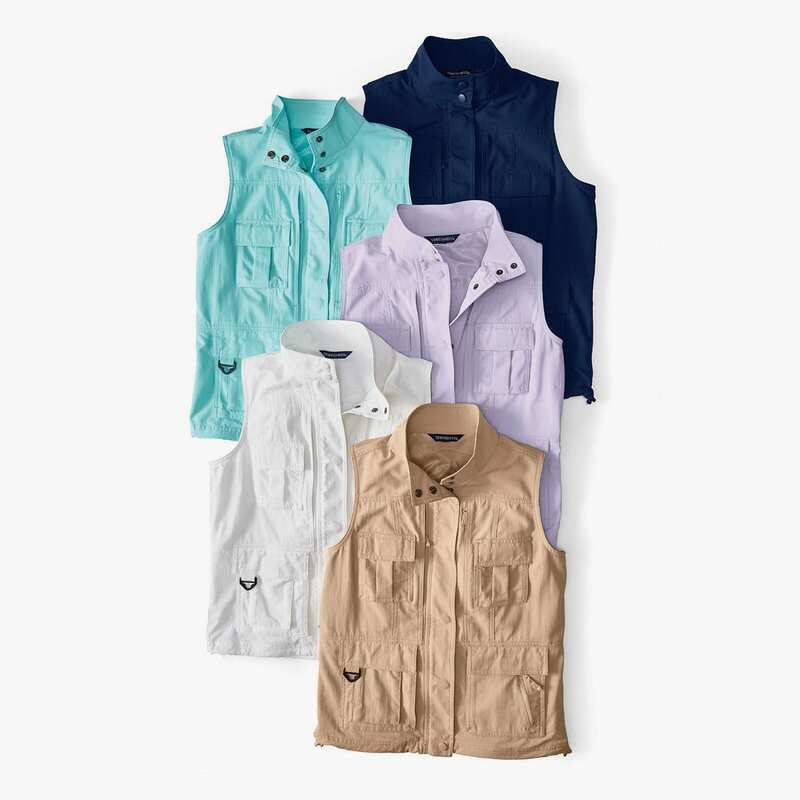 I like the lightweight feel and fit, but would really stress that this vest is more about organization than everyday wear. Still a solid choice. 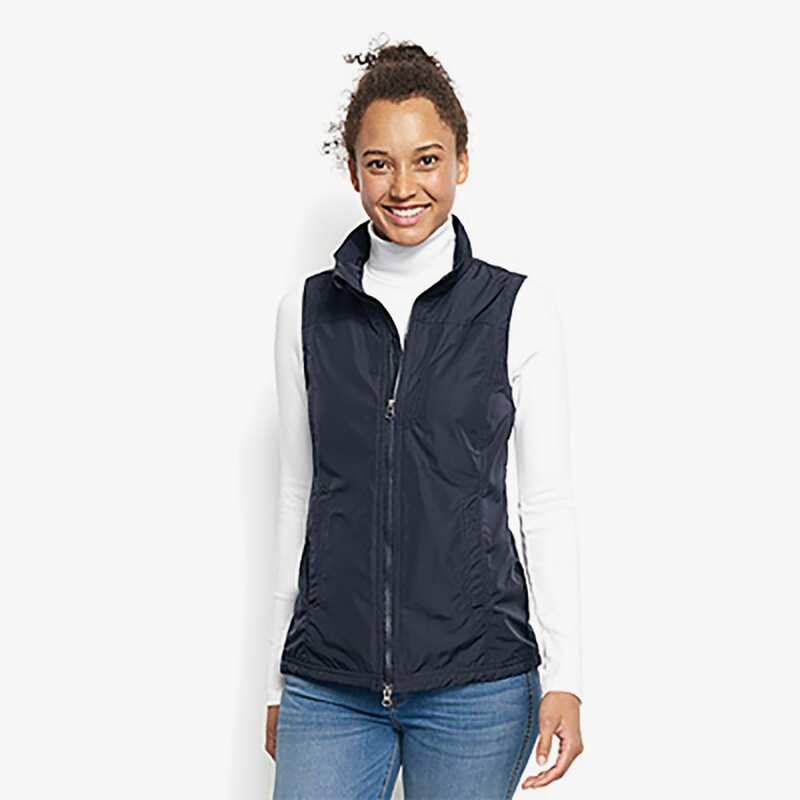 SCOTTeVEST also makes a more stripped down version called the 101 Vest with fewer pockets (this one “only” has 9 pockets) and a slightly more comfortable fabric and feel. It’s a more stylish and affordable option (thought it’s still $100), and would do well on the trail as a great alternative to lugging a day pack for short hikes. I’m a fan of the dual zippered chest pockets and sunglass shammy, because shammies are cool. Prove me wrong. If you want a travel vest that lets you hit the trails like a dapper dude, this is the action vest for you. 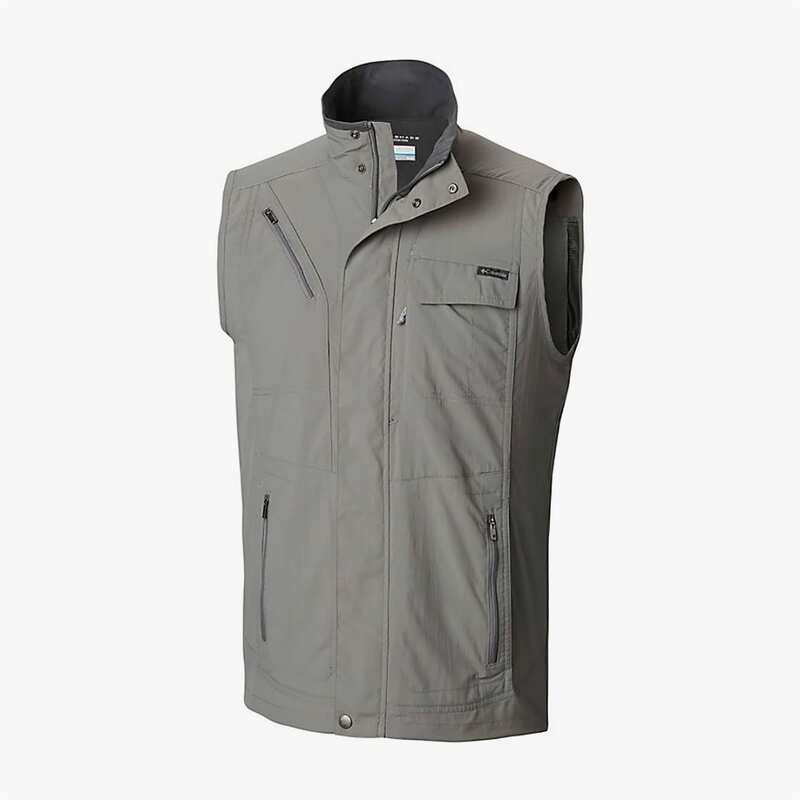 Made with “Omni Wick” fabric (I hate the name, but it’s a pretty great feature), this travel vest is designed to move with you and keep you dry, even when you’re working up a sweat on a good hike. Made from ripstop nylon (so it won’t snag), it boasts UPF 50+ sun protection. The zippered pockets, hand warmer pockets, and drawstring adjustable hem (nice) make this thing a beast for the outdoors. Let’s face it, you usually work up a sweat in a seam-sealed travel jacket after just a few minutes of hiking. Let your arms breathe with this travel vest and quit stopping to take off layers. Ok. Wow. This thing. Let’s start with the elephant in the room. This travel vest has 42 pockets. Yup. Four.Tee.Twooooooo. That’s nuts, but what’s even crazier is that it doesn’t look like it has 42 pockets. And that’s why it’s my favorite travel vest. This vest is perfect for die-hard or long haul travelers who like to have a lot of gadgets and gear close to hand, especially on the plane. It’s also ideal for photographers as the hyper organized pocket layout can handle all your camera gear including: lenses, ND filters, SD cards, and more. There’s even a huge back pocket for oversized gear. Yes, this vest is the priciest travel vest on this list, but, dang, is it worth it. Teflon treated for weather and stain resistance, so you don’t have to worry about your stuff getting ruined, it looks awesome, features a stowable hood for rainy days, and even boasts a “weight management system” so that you don’t look or feel like a garbage bag when you pack this thing to the gills. This travel vest is a boss, and is a great piece of gear for die-hard travelers looking to level up their carry on packing game. 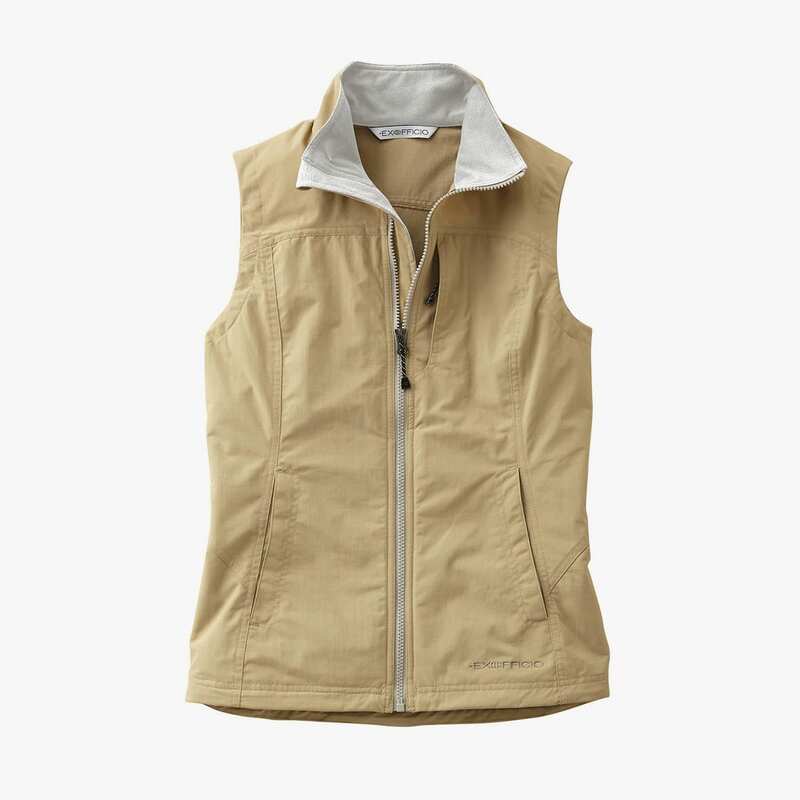 If you don’t care that you look like you’re on safari (you do you) this might be the perfect travel vest. No, this isn’t the most fashionable travel vest, but it’s loaded with functional features for the ultimate road warrior. Mesh lining and sweat wicking zones keep you cool on a hike, while the high snap collar, funnel neck, and drawstring hem (nice, again) keep you warm when it’s breezy. Made of lightweight durable fabric, it’s packed with zippered pockets for literally everything. Women who’ve bought this vest simply love it. The navy goes great with denim or other travel pants, and doesn’t look quite as “techy” as the khaki color. Just saying. I actually can’t believe this travel vest is under $40. Sure, it’s on sale right now, but still. That’s almost cheaper than a pair of ExOfficio travel underwear (which are also fantastic). 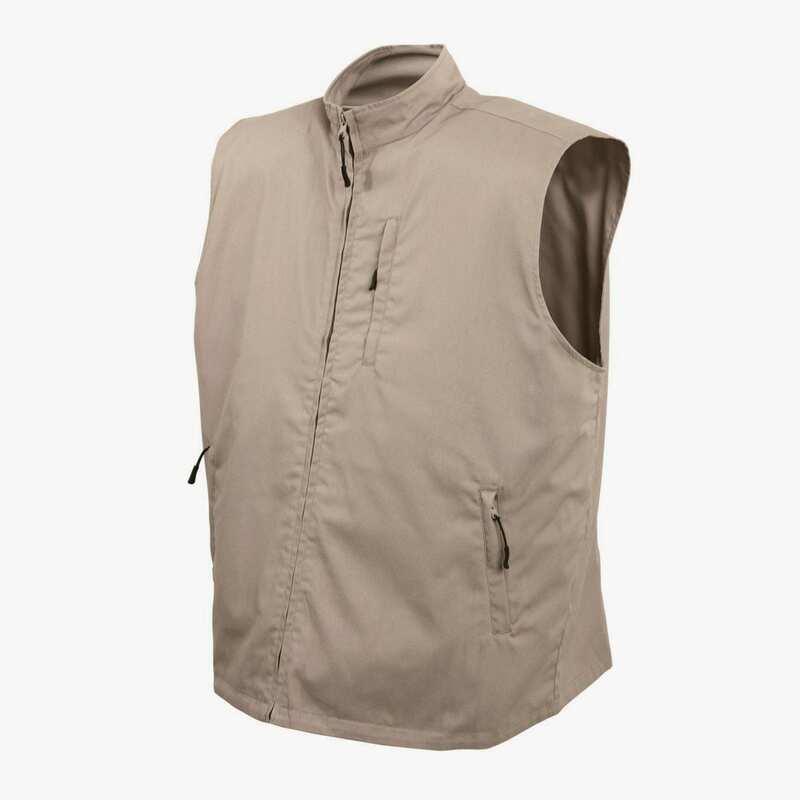 This travel vest is slim, lightweight, and stylish without sacrificing the functionality and pocket space of other travel vests. It has a sunglasses pocket (with microfiber liner), a key clip, a water bottle pocket, and even an interior touch sensitive pocket for your phone (which kind of works, but still, better than nothing). This vest is also more than enough to keep you warm on the next chilly flight, especially if you couple it with a nice long sleeved flannel shirt. Ok. So here’s the thing about “RFID Blocking” travel gear. It’s complete and utter nonsense. There has never been a single reported case of RFID identity theft. Ever. I’m serious. RFID blocking gear is travel snake oil. However, that’s not why I like this travel vest. 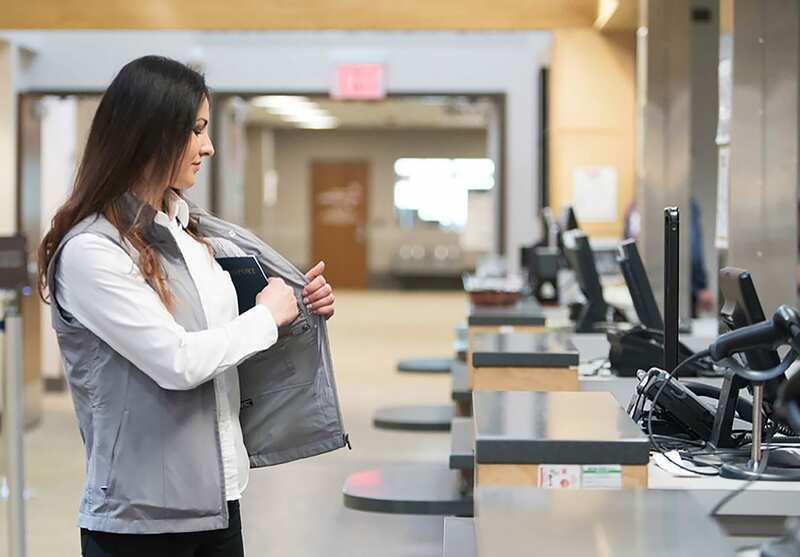 The SCOTTeVEST RFID Travel Vest is just a great vest with tons of thoughtful features. It’s made with teflon treated fabric for stain and rain resistance (awesome), and while the RFID pocket is just plain nonsense, it’s still a nice small pocket to keep your cards or cash organized. Just because RFID theft isn’t a thing doesn’t mean you shouldn’t keep your stuff organized. Lightweight, sleek (aka there aren’t any obvious “cargo” pockets on the outside), it’s packed with big usable pockets to store stuff like a phone, passport, boarding pass, and even an iPad or kindle. 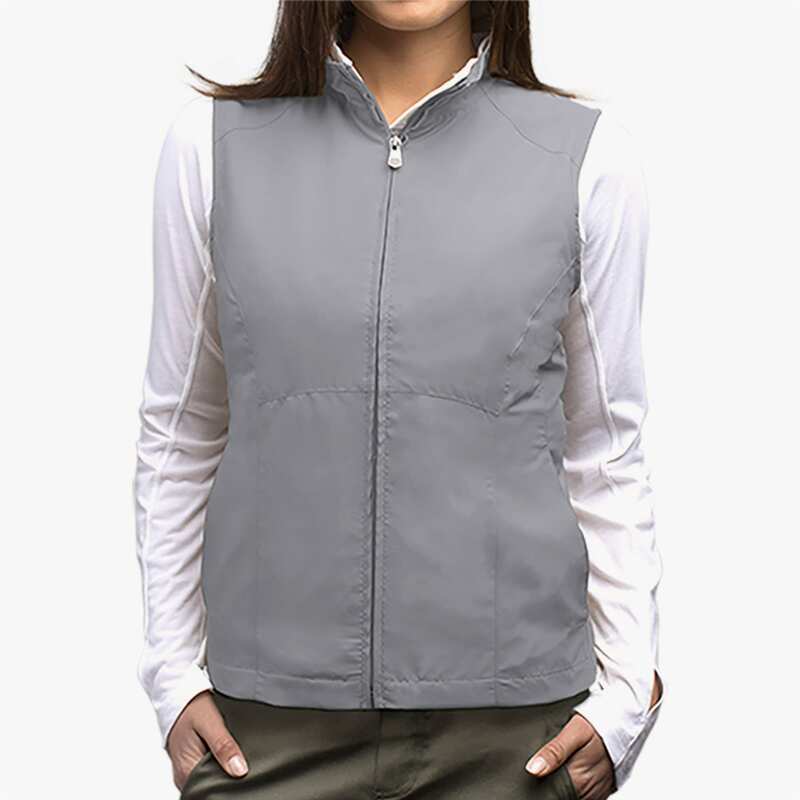 This is just a well made travel vest for women who like to travel with a lot of gear. Categorizing this travel vest is tough because it just kind of… works. The simple layout and clean lines don’t scream “I’M A BACKPACKER!” but it still more than gets the job done. Interior zippered pockets, comfy lining, mesh vents, storm-front zipper, and a small stuff sack packing design make this travel vest an everyday kind of travel gear—which is kind of the whole point. Understated but still built for the road, this travel vest is solid pick. The right travel vest can be the top layer you never knew you needed. 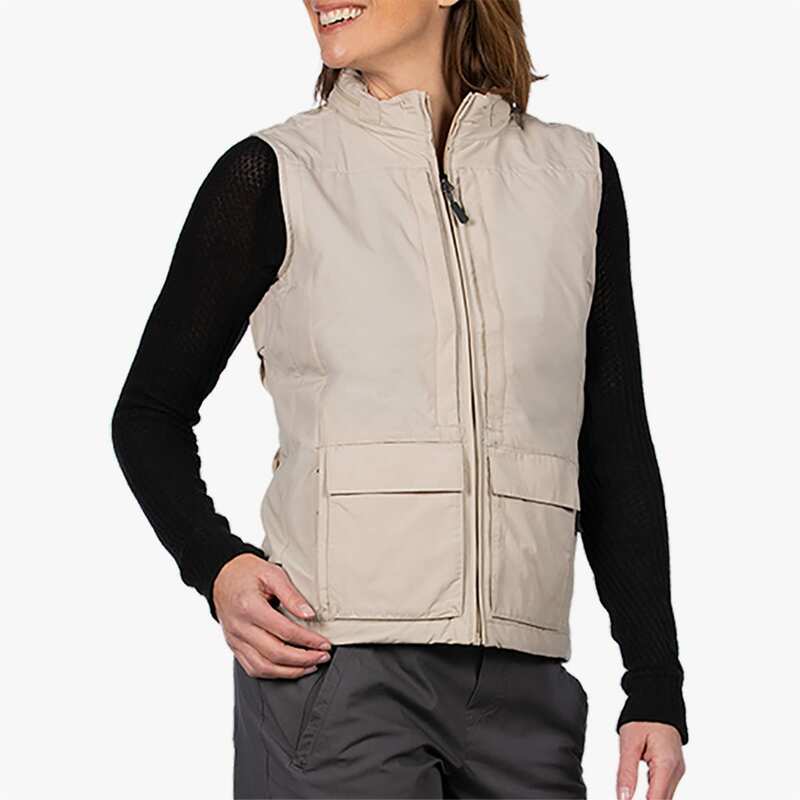 With added storage space, tons of zipper pockets for organization and security, and 3-season wearability, a travel vest is a great way to fly comfortably, avoid extra baggage fees, keep your stuff safe, and streamline your entire travel experience. Be careful, once you’ve tried a vest, you’ll never wear sleeves again.